In the business world, the most common meeting that is usually set is for sales. Conversations about profit and loss, sales targets, and marketing prospects are the typical topics. Writing an agenda is not a common practice in small meetings probably because of the little things that is usually being talked about. However, it is imperative still to write an agenda in a sales meeting. The same importance must be given to a sales agenda as in a meeting agenda. Although most people do not prefer to write one because of the time it takes from their schedules, it is still a good habit to prepare an agenda before a meeting. 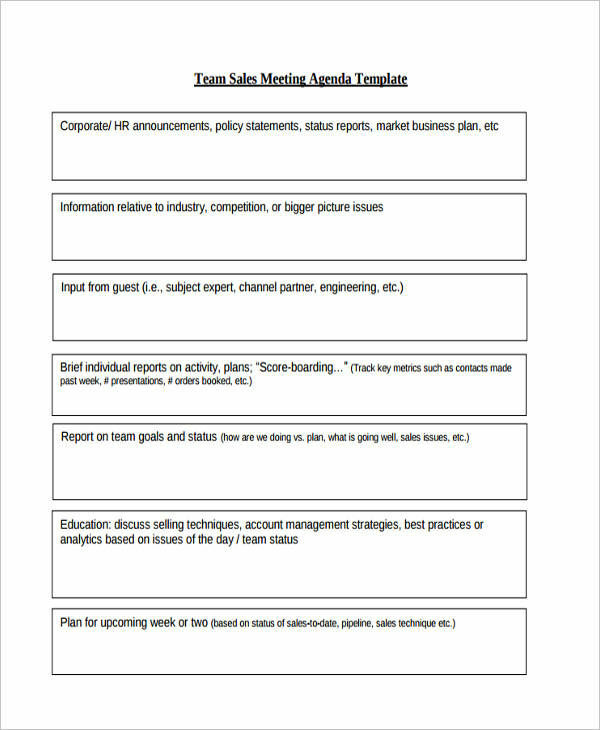 A sales agenda is a written document that contains topics and related details intended for a sales meeting. It is a key instrument to discuss about sales and any marketing update and/or strategies. Sales could be a single factor that is usually included on a business agenda. However, people who wants to set up special sales meeting with a client or within an organization usually draft an agenda. 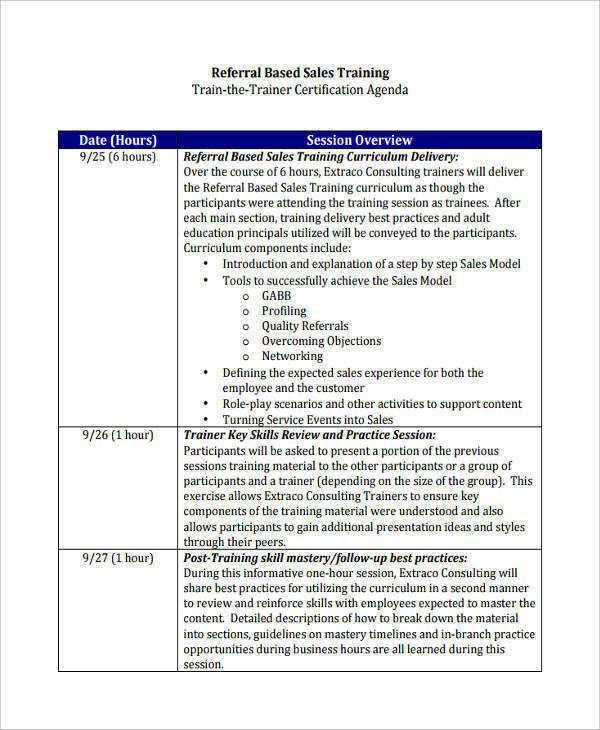 It helps them layout all the sales topics necessary in the meeting. It is also provides proper flow of discussion to provide an outward and positive result. In any written agenda (e.g. training agenda), there are always important items that needs to be added to make it more effective. 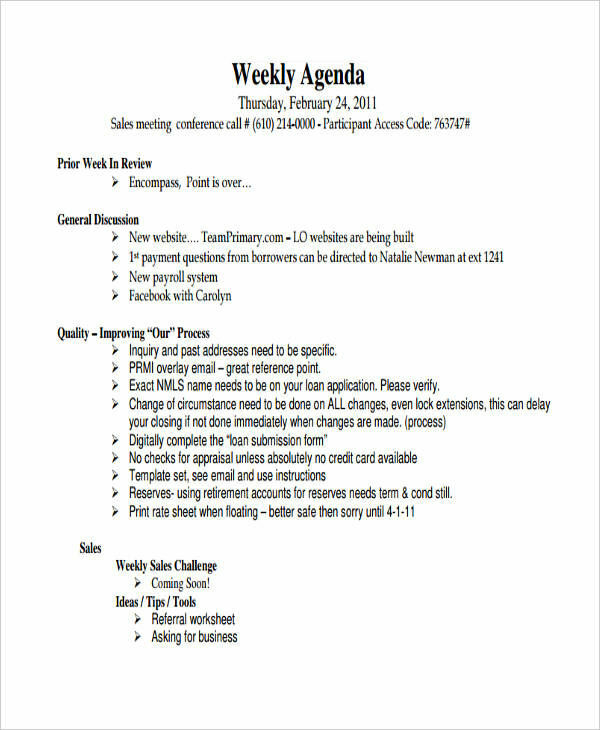 Here are the items to be included in a sales meeting agenda. Purpose of the Meeting. It is always a must to include the objective of the meeting to set the right mood during the meeting. Sales Highlights. Reports about any sales highlights should be discussed. It could be the product with the highest sales percentage or the lowest. Proper Timeline. Allot a time for each topic to properly facilitate the meeting and to ensure that all topics are covered. A lot of people who are into business have a common dream, i.e., to succeed in their chosen path. An important key to success that business leaders share is perseverance. The dictionary defines perseverance as “steadfastness in doing something despite difficulty or delay in achieving success.” The determination to prove everyone that despite of the challenges waiting ahead there is no backing down. In addition to that, setting a daily agenda for any client sales meeting could improve your performance in the race. You need to be prepared of anything that fate might throw at you. 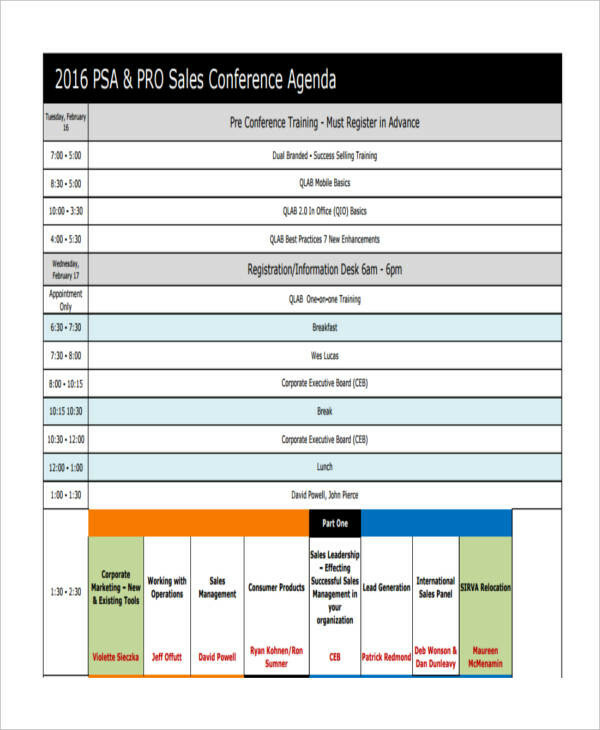 What Is Sales Meeting Agenda? 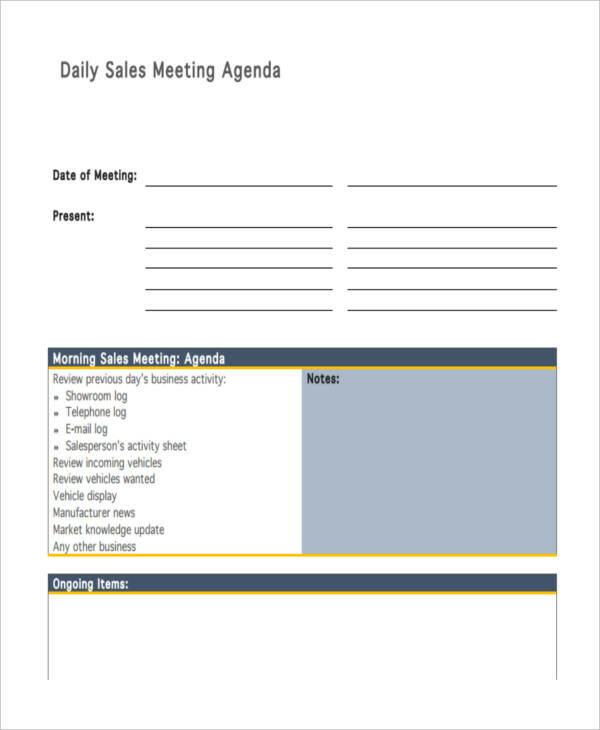 Sales meeting agenda is a document that contains collated ideas and topics that will be used for a sales meeting. It is an essential factor and plays a vital role to make a meeting a successful one. 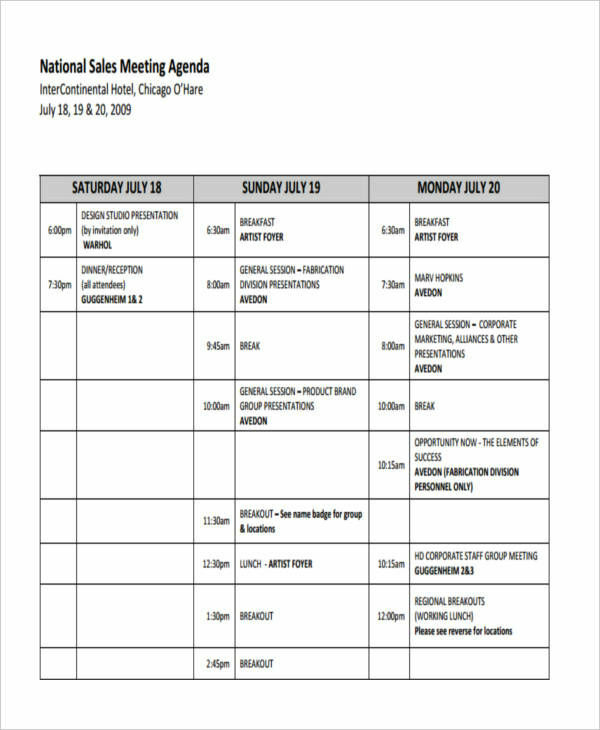 Just like a conference agenda, it lists down important topics with a scheduled time. An effective meeting agenda contains an outline of the subjects to be discussed, the people responsible for the discussion, and its corresponding time frame. In addition to that, it should have an objective. The goal of the meeting should be specified clearly to unify the mood of the participants.